Seventeen services of worship were held, conducted by each of the seven Presbyteries within the Bay of Quinte Conference, as well as by nearby congregations, a Masonic Lodge, the Lennox & Addington Historical Society, students at Queen's Theological College, the Benn family reunion, Quinte Branch of the U.E.L. Association, and others. There were special displays at both Toronto Conference and Bay of Quinte Conference, as well as at the Lennox & Addington Museum in Napanee, and the Loyalist Culture Centre in Adolphustown. Several artifacts were loaned from four archives/museums and from individuals. Earlier in the year, in January, some 5000 cardboard "'Mite Boxes" in the shape of the church were distributed to churches and homes across the Bay of Quinte Conference. One congregation in Whitby raised over $900 for us, of the over $1200 that was sent in. Don Hough counted 500 persons present for the main event--the Annual Pilgrimage Service. The weather was the first perfect day of the whole summer. A large tent was put up beside the church to accommodate the overflow. Four Circuit Riders in period costume rode in on horseback. Soldiers of the King's Royal Regiment of New York (a Loyalist unit who settled in the adjoining township of Fredericksburgh) attended in uniform. A delightful surprise was the visit of 24 members of Elbow Lane Methodist Church in Formby, England, who presented an illuminated address as a memorial of their visit. The German family, descendants of those by that name who were subscribers in 1792, also held a family reunion that Sunday, some coming from as far away as Texas. The Guest Speaker was the Rev. Dr. Charles Yrigoyen, Jr., the director of the Archives and History Commission of the United Methodist Church in the U.S.A. He unveiled a new marker identifying the church as "Historic Site No. 278" of his denomination. It is the first time they have listed a Canadian site on their historic registry. This was especially appropriate as it was their body, formerly called the Methodist Episcopal Church, which sent the early preachers into this province and built this church. 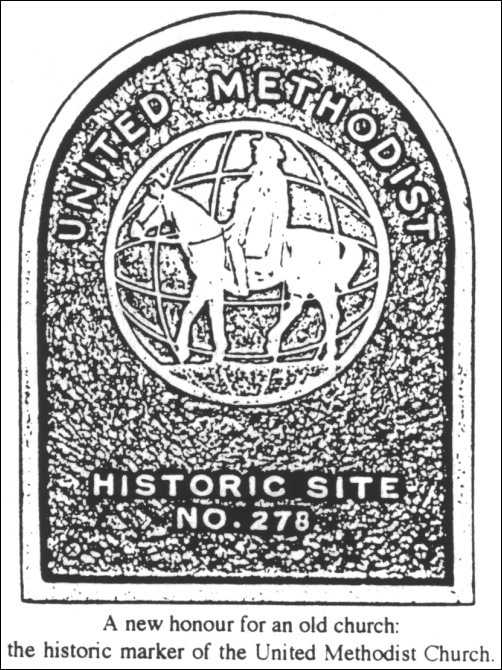 A new title, "The Oldest Foreign Mission Building of the United Methodist Church," can be claimed. Another pleasant surprise was a letter of fraternal greeting sent to us by the Rev. Paul Hulme, the minister of Wesley's Chapel in London, England. Built in 1778 by John Wesley, this shrine of world Methodism is only 14 years older than the Hay Bay Church. Thanks to Berkley Studio, the audio-visual department of the United Church of Canada, a very fine 7-minute cameo of the Bicentennial service was made. It has been seen several times on the United Church's weekly program, "°The Spirit Connection," which goes across Canada on VISION TV. Carolyn Martin was the producer. When she learned of the delegation from Formby, England, she became very excited. Her mother, now living in Canada, was a native of Formby. Her mother attended on the 23rd where she had a great reunion. Carolyn also transcribed the videotape onto British guage tape so they could show it to the members of the church back home. A nice touch. Any readers who would like to see it, should write to the editor of the Hay Bay Guardian. A review of the 67 pages of the 1992 Guest Book kept at the church, shows that visitors came from every province in Canada, plus the Yukon and NorthWest Territories. Over 150 came from 21 States. They also came from ten European countries, besides Australia, New Zealand, Papua New Guinea, Honduras, and one Pentecostal pastor from Zimbabwe. Including the many who visited but did not sign, we estimate some 3500 persons came last year. All of the mainline Protestant denominations were represented in the Guest Book's "Home Church" column, along with scores of Roman Catholics and one Russian Orthodox. Also represented were the Society of Friends (Quakers), Latter-Day Saints (Mormons), Christian Science, Church of Christ, Nazarenes, Mennonite, Seventh-Day Adventists, and a "Church of Inner Peace." Three marked that column with "NONE," "home worship," and "Quit!" Of course the vast majority were United Church people from Ontario. And many visitors identify their genealogical links with area Methodist ancestors, such as Davis, Embury, Roblin, Ruttan, Huff, Detlor, Allison and Vandusen. Peggy and O'Neill Barry from Wisconsin wrote, "5 ancestors among Founders."